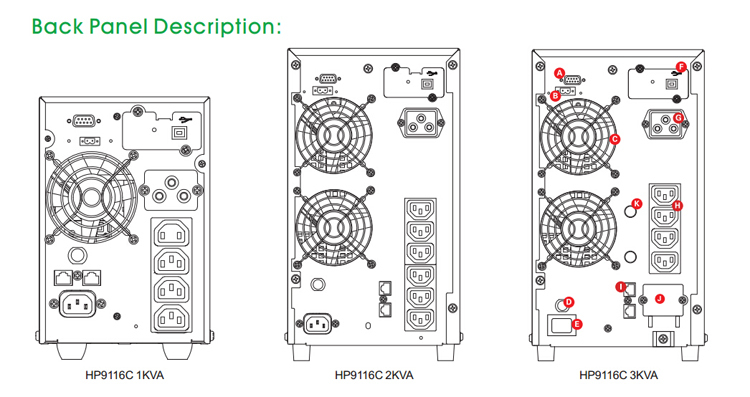 High frequency 3kva online UPS HP9116C （1ph in/1ph out）1-3KVA series have a high stability and reliability which was designed by SORO company according to different power grid environment and network system requirements. Its excellent quality and perfect usability can provide a safe and reliable guarantee for the computer network system and realize overall protection to user devices. ■Large blue backlight LCD for detailed real-time UPS status display. ■Pure sine wave double conversion 3 kva online UPS with voltage regulator circuit, which can provide a perfect power protection when UPS working in a harsh surroundings. ■Comprehensive electric isolation and bypass protection. ■Input PFC technology, reduce harmonic pollution to the power grid. ■Wide Input frequency range can connect various fuel generator. ■Adopt intelligent battery management, saving charging time and extend battery life. ■DC start when power off, convenient and reliable; restart automatically when electricity is restored. (1)Because of the normal power supply of the 3kva online UPS, the power supply of the electric power supply to the inverter is supplied by the UPS inverter. Because of this, the effect of any voltage fluctuation and interference on the load operation is eliminated from the fundamental. This is clearly not any kind of anti disturbance AC regulated power supply can be resolved. When the city electric voltage variation range is 180~250V, its output voltage stability range is up to 220V ± 3%, the working frequency of the sine wave is stable in the range of 50Hz ± 1%. (2)The waveform distortion coefficient of the 3kva online UPS output sine wave is the least, which is generally less than 3%. (3)On line UPS can truly realize the uninterrupted power supply to the load when the power is interrupted. As long as the battery can supply power to the UPS inverter, regardless of whether the city power is interrupted, the 3 kva online UPS is powered by the inverter to the load. Therefore, from the city electric power supply to the city in the process of interruption, the 3kva online UPS inside does not produce any conversion action, its power supply to the load conversion time is zero. 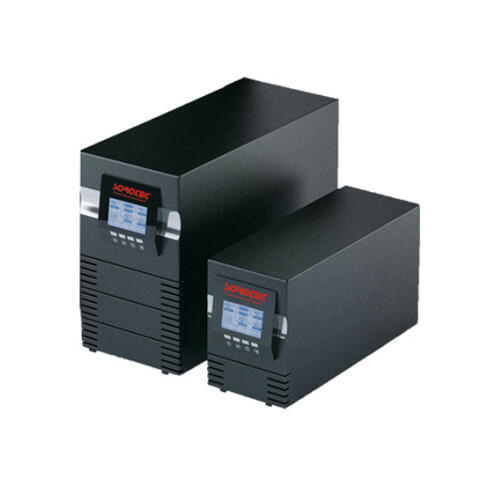 (4)Compared with the backup type UPS, the 3 kva online UPS has excellent output voltage transient characteristics. General in the l00% load loading or 100% load shedding, its output voltage range is about 1%, the duration of this change generally 1 ~ 3 cycle. (5)3kva online UPS is generally used PWM 20kHz technology, the noise is small, about 50dB. (6)3 kva online UPS control circuit, the input transformer, output transformer and a photoelectric coupler parts will be the high electricity drive part and a “weak” control part of the line from the viewpoint of electric isolation apart and the reliability of the circuit has been greatly improved. The failure rate of this kind of 3kva online UPS is very low.